This weekend we say goodbye to the lazy days of summer. 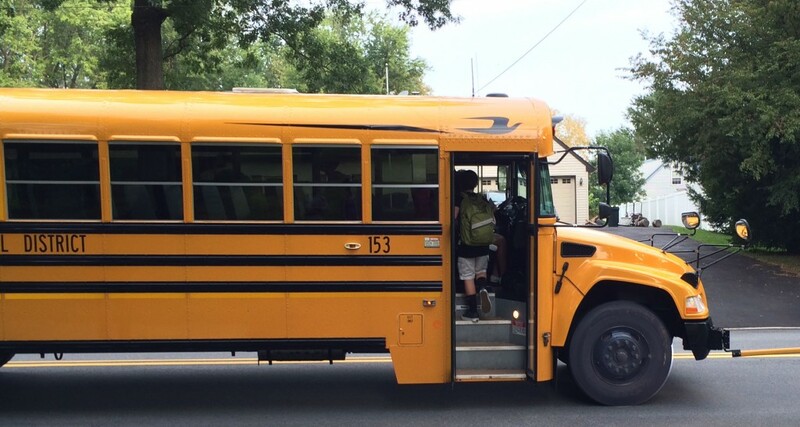 Now it’s time for backpacks, carpools, moving older kids back into the dorms, and weekend football games. As we head into fall things can get pretty busy. Before you drive your children, friends, and teammates around town, think about rotating the tires on your vehicle. Tires should generally be rotated every three to six thousand miles. Is your child learning how to drive this year? Good luck! Teach your driving teens to check the air pressure in their tires! Send them back to college with an easy-to-use Accutire Backlit Digital Tire Gauge. Also, now is a great time to begin thinking about winter tire needs. You’ll be planning your ski trips and holiday visits to Grandma’s house before you know it. Why not plan for tire chains, snow tires, or studded snow tires now? The worst time to remember to you need tire chains is when you’re stranded on the highway during that first big storm! Need help deciding what you need? Ask a Vulcan Tire representative! Due to consistent snowfall this winter, drivers in the northeast are reporting that roads are littered with potholes. Read on for information on how potholes cause damage and how to prevent it. Let’s begin with a brief explanation of how a tire is damaged by a pothole. Most motorists don’t realize that simply hitting the pothole itself does not damage the tire. What actually causes the damage is the action of the sidewall of the tire becoming pinched between the edge of the pothole and your vehicle’s wheel. 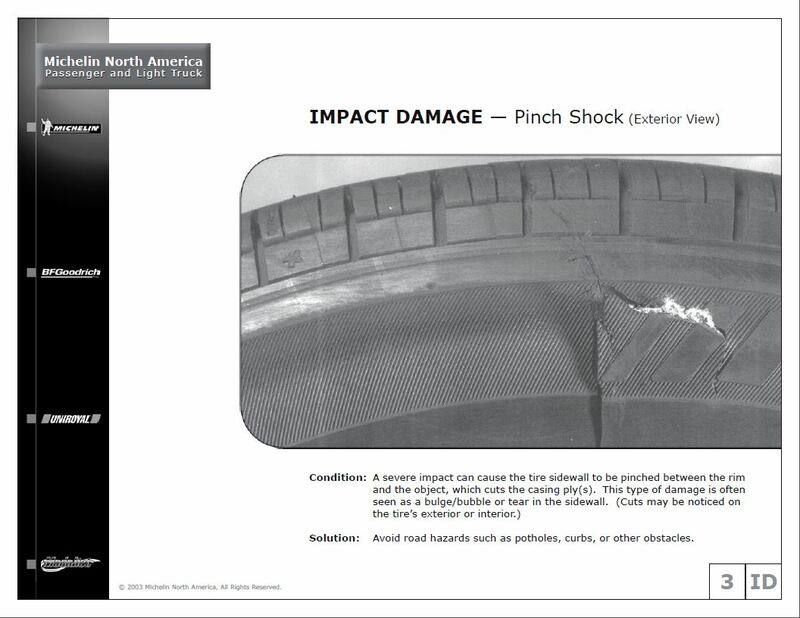 This type of damage is know in the tire industry as “pinch shock”. You can find an excerpt from the Michelin tire damage guide below. So, how do you prevent your tire from being “pinched”? It’s simple! Make sure your tires are inflated to your vehicle’s recommended pressure. Under-inflated tires are much more susceptible to pothole damage. The more pressure you have in your tire the more your tire resists being compressed. If your tires can’t easily be compressed, they have less chance of being pinched by a road-hazard like a pothole. Don’t overdo it! Too much pressure in your tires can also be trouble. Your tires and vehicle’s suspension are designed to work together to absorb inconsistencies in the road. Adding too much pressure to your tires will cause your wheels and suspension to take more impact from striking a pothole, resulting in a bent wheel or suspension component. It is best to inflate your tire to the recommend pressure for your vehicle. You can find the correct pressure for your vehicle on the Tire Information Placard located on the driver’s door jamb. (See sample placard below) Note that the specified pressure should be checked when your tires are as close to 70 degrees Fahrenheit as possible. In the end, the best way to avoid pothole damage is to avoid potholes. However, with the current condition of the roads in northeastern states like Pennsylvania, New Jersey and New York, it may be challenging to do so. Good luck out there and drive safe!